1 Are You Getting The Right Amount Of Pay? 5.1 So what drives people to work if it isn’t the money? Are You Getting The Right Amount Of Pay? Probably not, Let’s take a look at the issue of Bartender Salary. Let’s face it, sometimes its hard work and sometimes it’s easy work. When it is hard work though, having the best bartender salary available to you makes everything that little bit more worthwhile. You know the moment that you are cleaning up something that you shouldn’t be cleaning up unless you have a newborn. And the slightly intoxicated guy asks you if you “get paid enough money for doing that?” Well now you can finally answer them. 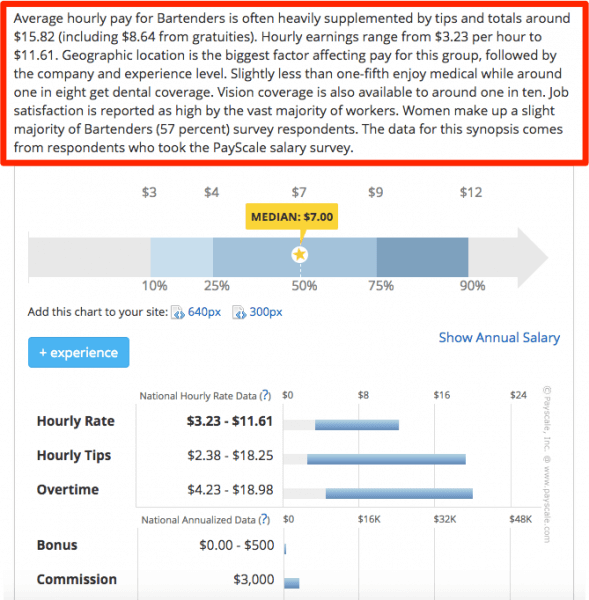 How much does my bartender salary compare to everyone else’s? Should I really be putting this insane amount of effort in for these guys? Am I getting paid what I deserve? So, how much SHOULD you be earning? What we are going to do for you is to take a look at Australia, USA and The UK and the current bartender salary stats that will give you a better understanding of where you are at financially at the moment, why do some of us do this job if it isn’t for the money? And, perhaps most importantly, how to increase your bartender salary if you need to. Australia with its big cities and long beaches really does have a treasure trove of cocktail bars and pubs that are not only incredibly cool but are expertly run in most cases. With Melbourne just been voted once again the most liveable city in the world and Adelaide taking the number 5 spot there is no reason for a bartender not to settle here and have the time of their lives. Lets take a look at what Australia pays it’s bartenders. Now as we can see above. 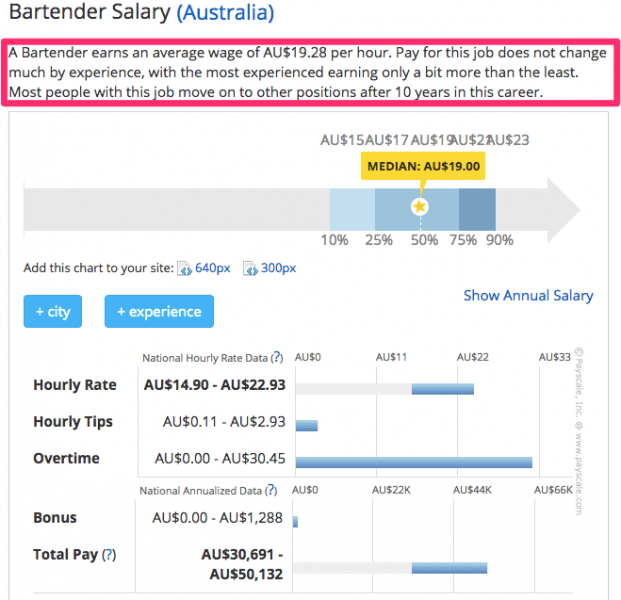 Australian bartender salary on a whole sits at an average wage of around $19ph. It doesn’t matter how experienced you are as a bartender, if you take the bartender position you will be earning around the same amount as the newcomer. 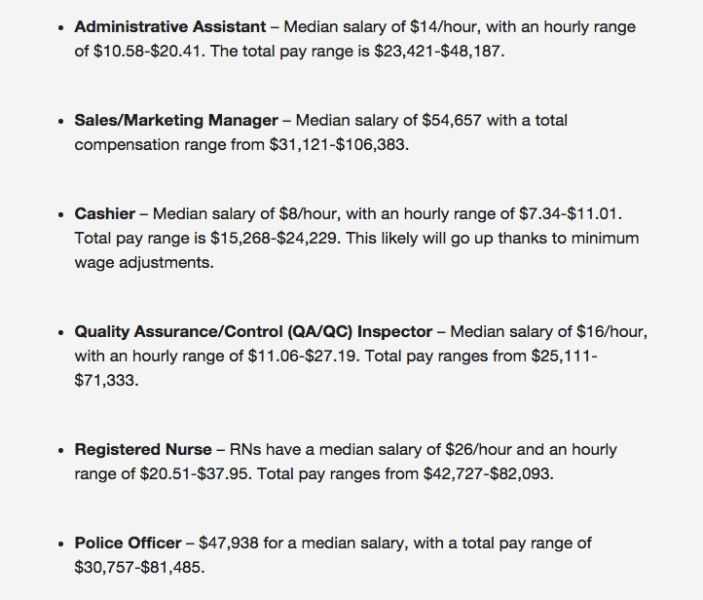 Bummer we know, but there as to be a reason for us to want to do it when the average wage of a full time Australian earner in any profession stands at a little over $75k a year as you can see in the image below. Okay so we know that the average wage of a bartender on a whole here is grossly less than the national average but what happens to that bartender salary when you get the promotion and become a bar manager? We both know that because you are following this site you will all hopefully get a promotion at one point and step closer to a pay that matches your talents and commitment. Australian Bar Managers have an average national salary of $49K AUS still short of the overall national average. 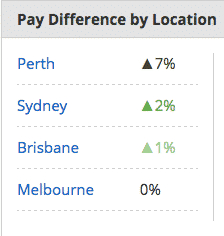 Remember that this amount is spread out across the whole country so lets take a look at which regions have a higher pay difference from the $49K AUS. 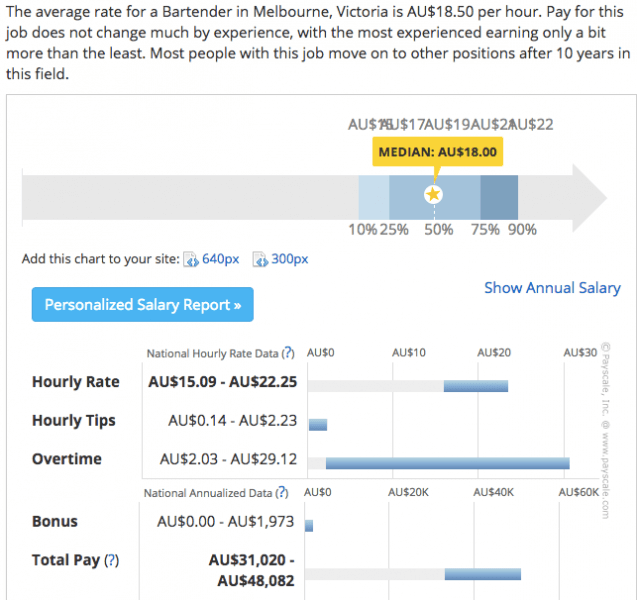 So if Melbourne hits the national average bar manager salary how does it sit on the average bartender salary? Well let’s take a look below. Bartending in USA is for many the holy grail, a chance to earn a great wage from tips and move up very quickly within the industry. This is all according to Julie Reiner who is the beverage director and co-owner of the Clover Club in Brooklyn, New York, and founder of the consulting firm Mixtress Consulting. So it seems that the USA is a great place to learn the trade and become the bartender you want to be. 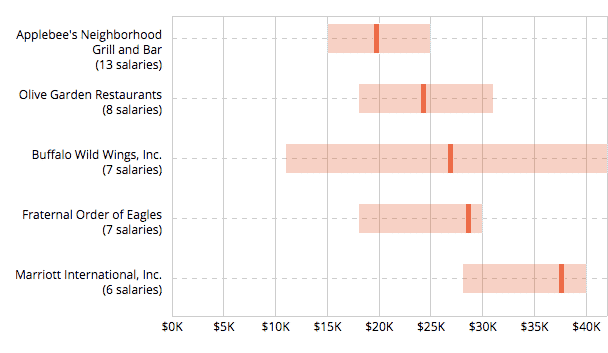 But how does the bartender salary stack up across the board? We can see here that the hourly rates differ so much throughout the country dependent on your geographical location. But one constant stays the same no matter where about you choose to work and ply your trade, that is that your wage will be heavily supplemented by tips. In fact more than half of the average American bartender salary is made up by Tips alone. But what does this equate to when we look at it as a yearly salary? That’s an average of around $25,000 USD for a bartender per year. But the difference between bottom and top learners is so large compared to that of the Australian and UK Bartender. It comes down to two major aspects that effect a bartenders salary in the USA – The aspects are Location and Experience and it heavily changes how much you get paid. But in what way? 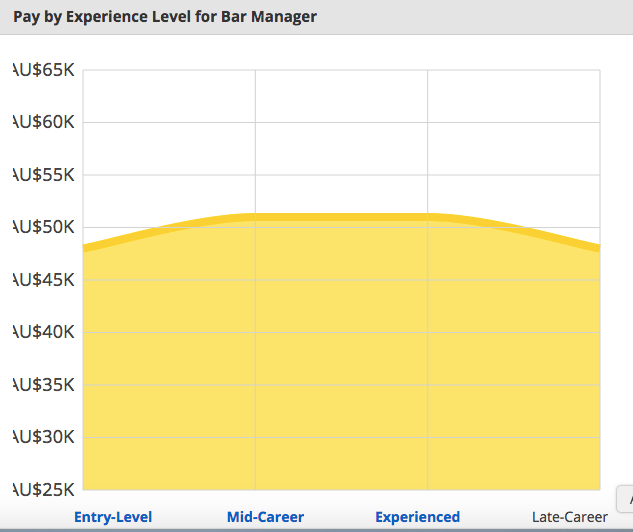 First lets take a look at experience and how that can effect your bartender salary. But why are we seeing this trend in America but not elsewhere? We believe it to be based on the attitude that others have towards bartenders in general. As Steven Poland says on abarabove.com, the difference between British bartending and American bartending is “Being able to tell people you are a bartender”. He argues that outside of America working 60 – 70 hours a week 5 days a week as a bar manager or bartender isn’t seen as a valid profession. Whereas within the American system bartenders have an opportunity the reach there full potential through experience and further training. It’s this great attitude towards the profession in The USA that allows bartenders to flourish therefore making experienced ones more valuable to a company or independent bar and in turn they are paid more for their services. However in other countries where this attitude towards the profession isn’t shared you will see a lot less make it to this level of experience and pay before dropping out of the profession. So a bartender salary changes from state to state, but why? Rob Doherty believes there are a few giant reasons for this to be the case. Minimum wages: The laws differ from state to state. Some employers in some states have to offer a fixed wage next to the tips that the bartender already earns whereas some states the bartenders can work just for tips. Whereas in the traditional conservative regions bartenders can earn considerably less than the more liberal states. 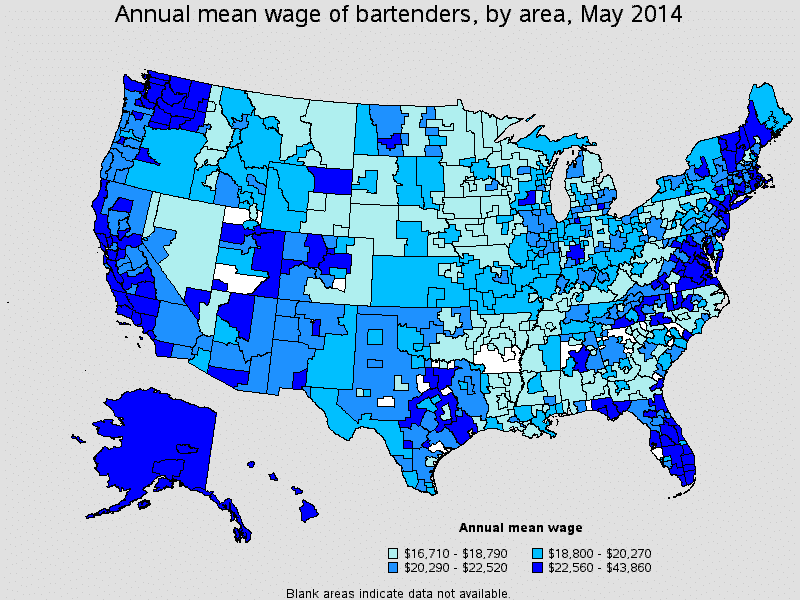 This image below shows the average wage of a bartender throughout the USA. Put simply, the darker the blue the more the average bartender salary is. We can take a look at this in another way here below. Let’s take a look at the Top paying Metropolitan and NonMetropolitan areas within the USA. Are you working in one of these areas? If so are you earning at least the average? Fox Business took a look at some of the average salaries in the USA that you can see in the image below. We know already that the average bartender salary (the whole of the USA) is around $25,000 USD. So where does this fit in on the scale? Well we can see that a bartender with limited experience can make more than an experienced cashier, as well as keeping up with all the other professions in terms of a competitive salary when you take into account that you do not need a university degree to bartend and so you can spend that time building experience to ultimately make you same amount of money as a fresh graduate who as taken a course in Business Administration. Interestingly enough as well we found some differences in how much different companies actually pay on average for their bartenders. Take a look at the graph below to see where your employers sit on the generosity scale when it comes to your salary. 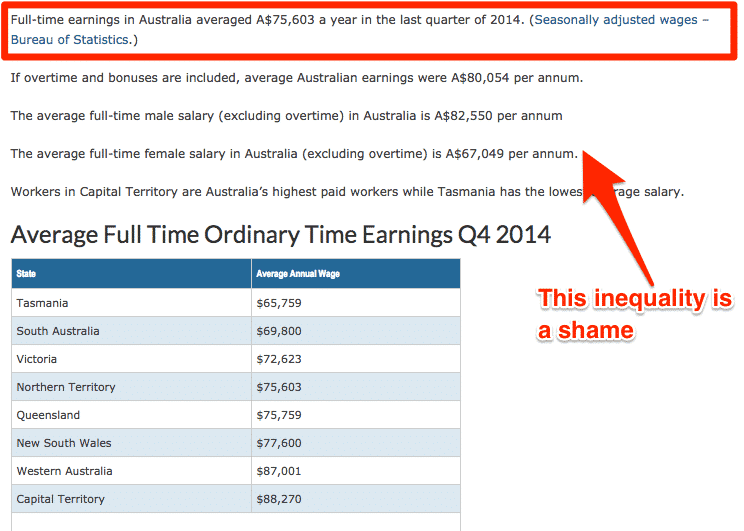 Let’s jump straight in with a look at how much the average wage is. Now as we can see above. 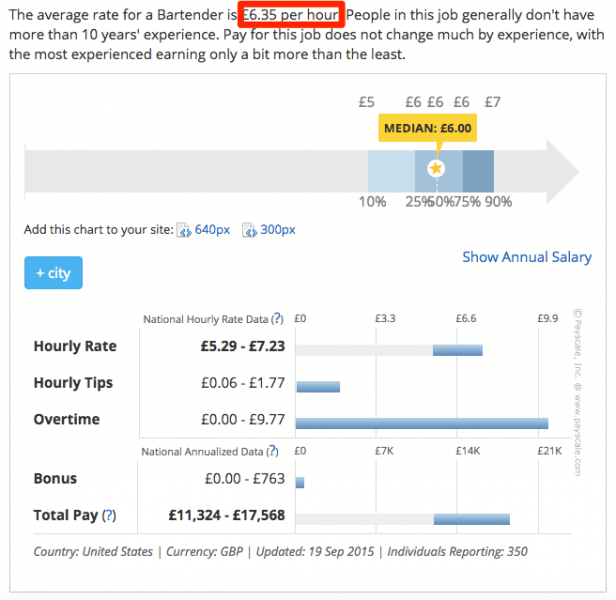 The UK bartender salary on a whole sits at an average wage of around 6.35GBP per hour or around 14k per year with the median hitting nearer the 14.5k per year mark. 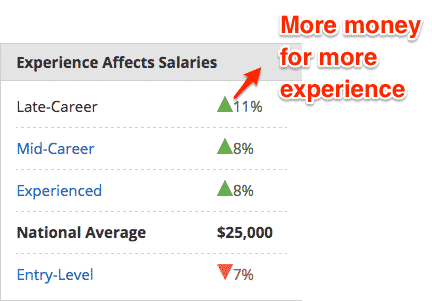 In fact it has an opposite correlation between experience and pay to what everyone would expect. 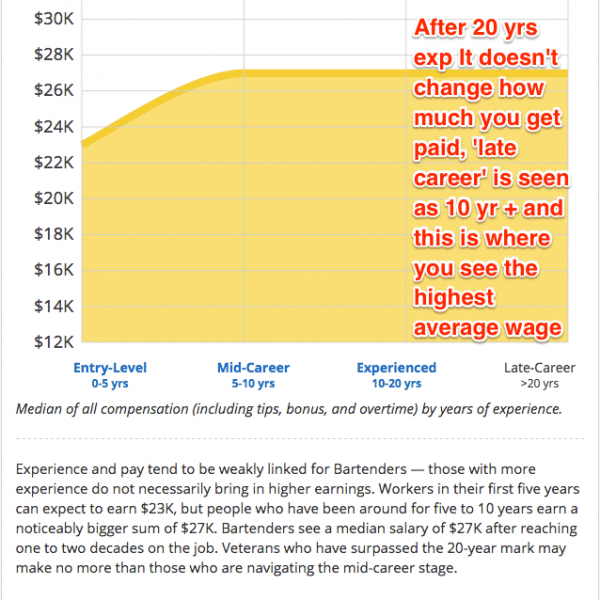 A mid career bartender actually earns more than the experienced bartender. 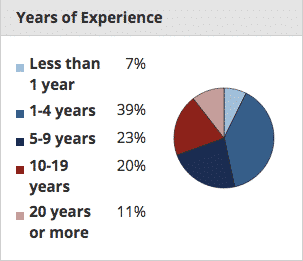 And when we take a look at the levels of experience on average in the bartending industry we can see that it is true that most bartenders, in fact a whopping 78% of all of them are in the first stages of their working lives. Which means that the Minimum Wage will play a large part in how much people are being paid. and you have to be over 18 to be a bartender in the UK. Then the average wage for a 50/50 mix of these two ages is 6.00 GBP per hour. The average wage for the UK as we know is 6.35 GBP per hour (though these figures are pushed higher with the average London wage). And we know that most employees are in there first jobs where minimum wage is most likely the pay they receive. How is it possible for you guys to push for more pay if you are earning more than the national average? 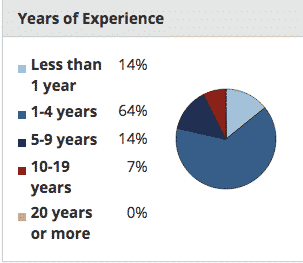 Does the minimum wage mean that employers are only employing inexperienced 18 year olds? just so they can save money? As the minimum wage actually made it harder to move up further within the industry? or at least removed the intensity? 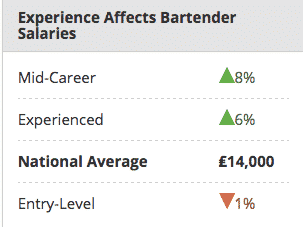 But does this average actually mean you are earning less than other bartenders in other cities? This is a question of the average living costs and London falls pretty highly on that ladder. 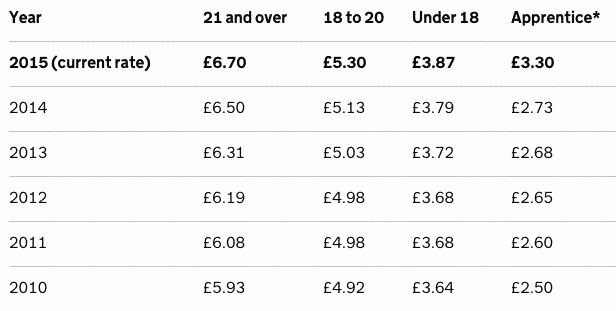 London’s living wage is a incredible 9.40 GPB per hour on average which leaves the average bartender salary falling very short of making a comfortable wage. The Secret Bartender as gone even further and argued that the Bartending wage is actually a lot lower than what it seems on the face of it. When you look at it that way, are you really happy with how much you are being paid? If you are interested in what the Secret Bartender’s solution is to this problem, then see here . Where abouts on the monetary level do you sit? 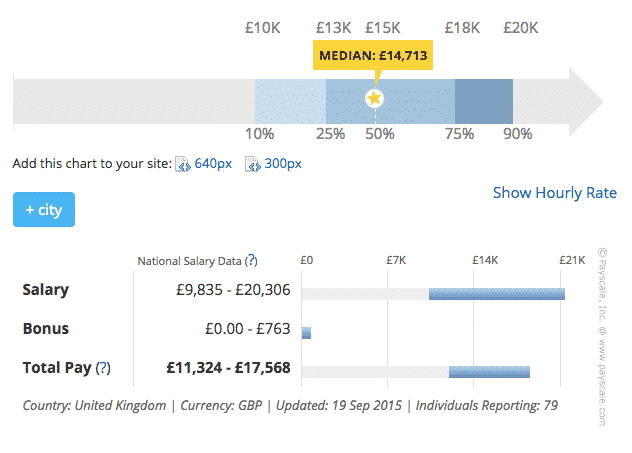 Use the data as a tool in order to be more clued up on pay within your region and ultimately country. Its not all about the money in the end. But now you know how much statistically you should be getting. Always remember that you are only worth how good you are and more importantly how hard you try. So what drives people to work if it isn’t the money? Why every week do millions of bartenders start their jobs when others are starting their nights out? We can only speculate – So we held a small poll and these are the top 4 results that came in. Some of these are quite interesting and also quite surprising in their own way. We have all worked those awkward corporate Christmas parties where a group of non-people get together and excruciatingly engage in small talk for 4 hours. We believed that this would rate higher in the poll. It is also worth noting that this passion cannot be taught. There is a direct correlation between this passion and the bartenders that make it into stars within the industry and also ultimately make the money. These are the people who are actively looking for new jobs or they may be studying and plying the bartending trade just as an in-between job until they have finished their studies. In short these are the people that don’t see it as a career and so are doing it for the money that it is bringing in at the moment. Nothing wrong with this – Our bars wouldn’t run without these people. What we want to know is why you guys go to work? Do you have any pay horror stories that you wish you could of avoided? We’re also interested in knowing if you are being paid correctly or not, stats are great but they can’t rival real life first hand experience. This is actually brilliant. I have done a similar analysis myself after bartending in many places, and this is why I ultimately decided to move back to America. I love my craft, and this is why I stay in it, despite the financial difficulty. I am planning my next moves in my career, and I believe there are many other avenues to take to accumulate wealth while still staying in the industry. Great post! Looking forward to future posts! Hmm it seems like your blog ate my first comment (it was super long) so I guess I’ll just sum it up what I wrote and say, I’m thoroughly enjoying your blog. I too am an aspiring blog blogger but I’m still new to everything. Do you have any recommendations for first-time blog writers? I’d genuinely appreciate it. What particular area are you looking to blog on?